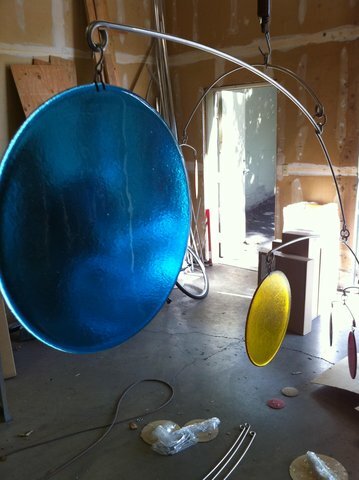 We just finished up another collaborative project with local mobile artist/glass worker extraordinaire, Leah Pellegrini. (See November 11, 2008 for the first collaboration.) The project included a set of four 8-foot-wide by 4-foot-tall mobiles. Leah designed the mobiles and created the glass shapes. We did the wire bending, balancing, packing, and shipping overseas to the Hong Kong International School.